I recently read a great article in Inc. magazine about big US retailer Best Buy and its comeback from the brink in 2012 (1). Best Buy is a $42bn consumer electronics retailer, founded in 1966 in Minnesota. 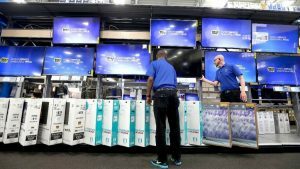 More than half its sales come from computers and mobile phones, but it also famously sells big screen TVs that people scramble for on Black Friday. It’s a big business and in 2012 it was looking like the next retail dinosaur to go extinct. The CEO had just resigned, employee engagement was at an all-time low and they had to close their failing China operation. Sears filed for bankruptcy, Circuit City and Borders Books went bust. 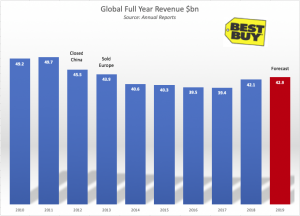 Best Buy sales crashed and the company went into urgent re-structuring. “People had left them for dead, given the Amazon effect,” pundit Joe Feldman said on Bloomberg TV. But they didn’t go under. New CEO Hubert Joly came on board initiating a ‘Renew Blue’ strategy and has managed, against the odds, to turn things around. Sales are up, share is up and staff love to work there again. How did they do it against the 800-pound online gorilla called Amazon? Unlike many classic retail brands, Best Buy seems to have found the formula to survive in a world dominated by online only retailers. They focused on what they could do and Amazon couldn’t – the human part. Focus on the Core: Joly set about divesting the underperforming and non-core parts of the business. The loss-making European business went, as did the Mobile-phone only stores and the troubled ‘Big Box’ mega stores. All this meant that management energy & time could be exclusively focused on fixing the core of the business, without being distracted. Make Service Work: Often described by the media as a ‘bricks & mortar’ retailer, the real difference versus Amazon isn’t in the buildings but the people – the everyday interactions between sales staff and customers. Best Buy realised that to grow sales, they needed not just to create a few headline ‘wow’ moments that look good on a Facebook post or in an ad, but to change each and every one of these interactions in every store; grumpy sales assistants do not help build brand preference. 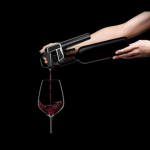 They re-instated a much-missed staff incentive plan, made broken internal systems work and introduced more product training so that employees really can talk with confidence. When you can’t win, neutralize: Increasingly, consumers were ‘showrooming’ – coming into the store to test a product, get some advice, then go and buy it online where it’s cheaper. This was a killer effect, as Best Buy could not beat Amazon on price. So they didn’t try to, they set up a price matching system. Now when consumers come in to try something out, they can buy it there & then at the same price as online – why not? Joly also improved delivery times to match those of the online retailers. Build your distinctiveness: The one area that Best Buy can outdo online retailers is in personal service & advice. They boosted their ‘Geek Squad’ installation & repair service by adding ‘In-Home Advisors’ who come to your home and advise what tech you need and help you decide. Importantly, they are not incentivized by sales, but are salaried employees. Their focus is to create happy customers. This is a critical difference vs Amazon, who can only suggest what you might like based on other people’s purchases. 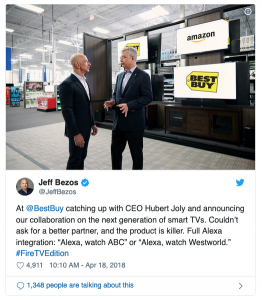 Keep your enemies closer: Best Buy last year announced a tie up with, you guessed it, Amazon.They are working together to sell TVs with integrated Amazon Fire Stick and Alexa capability. CEO Hubert Joly now has Jeff Bezos in his phone’s ‘Favourites’ list. Smart. 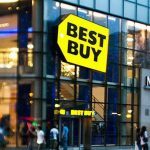 Big brands and even retailers can fight back against what seems like an inevitable decline and Best Buy shows how. “There’s plenty of room for both of us” is a great viewpoint from CEO Hubert Joly, who is keeping his enemies close to make sure he can stay at the leading edge. I wait to see how they can build in moredistinctiveness as Amazon continues to grow.